Operations have really increased across Baghdad with large weapon caches found, and many criminals and insurgents captured or killed. When there is a time-line shown, you can see how busy our troops are and those of the Iraqis. Read about other progress stories from building bridges, discussing the future of surveying, to the inaugural Anbar Security Conference. There’s a delightful story about comic theater coming back to Wasit province. BAGHDAD – Iraq SF and soldiers with Co C, 4th Bn, 64th AR, 1st BCT, 4th ID uncovered several weapons caches, containing a 130 mm mortar vound, 12 120 mm mortar rounds, 6 155 mm artillery rounds, a 40 lb. ba of ammonium nitrate, a 60 lb. bag of unknown chemicals, 4 RPGs, and assorted ammo & equipment. BAGHDAD – In the Sadr City district of Baghdad May 8, at approx. 1:30 p.m., soldiers from the 3rd BCT, 4th ID, were attacked by criminals with RPGs and small-arms fire, returned fire and killed one criminal. At approx. 2 p.m., soldiers from 1st Bn, 68th AR, 3rd BCT, 4th ID, identified one special group criminal on a rooftop with a weapon, engaged the criminal and killed him. At approx. 4:30 p.m., soldiers from 4th Bn, 64th AR, attached to 3rd BCT, 4th ID, and 1138th Eng, Bn, were attacked with RPGs and small-arms fire while they were emplacing barriers to provide security for the residents of Sadr City. Soldiers fired a tank round and machine gun fire, killing 3 criminals. Soldiers from 1138th Eng. Bn were later struck by an IED while conducting a route clearing mission at approx. 5 p.m. Soldiers were then attacked with RPGs and returned fire, killing one criminal. No soldiers were injured in the IED attack. BAGHDAD – May 7, Soldiers from 3rd Bn, 187th Inf Regt, 3rd BCT, 101st Abn Div (Air Assault), acted on a tip that there was a weapons cache in the area. The cache contained 82 57 mm rockets, 95 82 mm mortars and 23 120 mm rounds, all of which could have been used as IEDs. TIKRIT, Iraq – A ribbon cutting ceremony officially opening 2 temporary bridges in Bayji was held May 8. These 2 bridges, which expand over the Tigris River, will promote more trade and stimulate the economy of the region by allowing the people of the provinces of Salah ad Din and Kirkuk to unite. Col. Melvin L. Burch, cmdr. of the 111th Eng. Bde, thanks officials, the Iraqi military and respective Sheik leaders for their support in efforts to connect the surrounding communities. 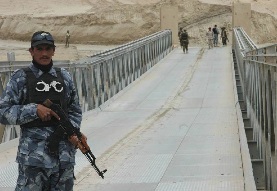 An Iraqi policeman stands guard on the bridge May 8. CAMP FALLUJAH – MNF-West Marines hosted the inaugural Anbar Security Conference at Camp Fallujah, May 8. Approx. 40 key leaders from the IA, IP, Dept. of Border Enforcement and the Provincial Security Force participated in the event. Anbar’s security situation and Iraqi SF organization were discussed during the conference. Anbar Province is making progressive strides toward improvements, such as voter registration, elections and Provincial Iraqi Control. The ISF’s role will be essential to ensuring the security and safety of Anbar’s citizens. Marine Maj. Gen. John Kelly, MNF-West comm. gen., answers reporters’ questions about security. The media represented radio, television and newspaper agencies from various western, international and Arab news agencies. BAGHDAD – The senior consultant for water resources in Iraq, the MNC-Iraq geospatial team and Iraqi surveying engineers from the ministry of water resources, discussed the future of a geospatial reference project Iraq is currently taking over, at the U.S. Embassy in the International Zone, May 5. The project, called the Iraqi Geospatial Reference System project, will provide a more accurate reference system for navigation, and reconstruction in Iraq much easier. “The system helps construction workers and civil engineers throughout the country with building bridges, highways, buildings and helps with the irrigation systems and the accuracy of dams,” said Staff Sgt. Anas Malkawi, a geodetic surveyor with the 100th Eng. Co., 20th Eng. 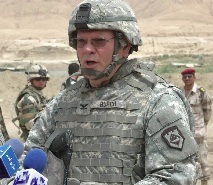 Bde, who spoke with his Iraqi counterparts during the meeting. While the U.S. military continues to guide the country of Iraq to successful re-construction, one of the largest steps has already been taken. With constantly updated coordinates, a more accurate geospatial system for navigation and the right experts to put it into use, Iraqis are well on their way to standing strong. This is being financed by the GoI. Staff Sgt. Anas Malkawi, discusses the locations chosen for future geospatial reference system points across the country of Iraq with Iraqi surveyors from the ministry of water resources. TIKRIT – The SoI repelled 2 attacks in northern Iraq over the last two weeks. In Diyala, SOI members defended the village of Khawalis from an AQI attack. According to reports, the SOIs took sniper and mortar fire, but repelled the attack killing 12 AQI members. In Salah ad Din, SOIs led CF soldiers to a large weapons cache, consisting of 800 pounds of homemade explosives and other IED making material. The SOIs were ambushed during the op and successfully repelled the attack. BASRA – CF engaged the enemy rocket team with counter-battery fire and an UAV identified rocket rails and a vehicle. The UAV and an AWT engaged with Hellfire missiles, killing 6 Special Groups criminals, destroying the rails and one vehicle. This was the first indirect fire attack causing casualties among Iraqi civilians in Basra since March 27. The security situation remains stable with 70% of the city secured by Iraqi SF. BAYJI – The SoI are quietly making large strides in the northern Iraqi city of Bayji, along with soldiers from the 1st Bn, 327th Inf Regt, 1st BCT, 101st Abn Div. “Without witnessing what goes on in our cities every day, it’s most likely that someone wouldn’t understand the importance of these seemingly small changes,” said Capt. Michael Sykes, Bn adjutant. Numerous roads have been opened, easing travel restrictions and making commuting to work possible since the battalion arrived in theatre in October 2007. “There has also been a dramatic drop in IED craters, which disrupts travel and places a burden on many honest, hardworking people here,” said Sykes. The Bulldog soldiers credit the SOI for the dynamic change here. “The SoI’s presence alone on the streets here are directly corollary to the drop in attacks in our area,” said Maj. Brad Mock, the bn’s EO. Other contributing factors to the reduction in violence are multiple cache discoveries and the capture of key insurgents in the area, said Mock. Work is also underway to improve the battle weary roads in the area by pouring fresh concrete. “Fewer roadside bombs have persuaded the govt here to spend its resources on repaving roads. “We all know that when we leave here, the Bayji area will be a better place than when we arrived, and we couldn’t be any prouder than that,” said Mock. BAGHDAD – Iraqi SF detained 3 insurgents wanted by the GoI in Baghdad, May 7. An Iraqi ERU served warrants and detained the 3 suspects in the Adhamiyah area of Baghdad. 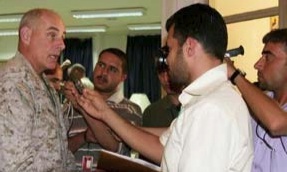 The group is suspected of murdering and displacing Iraqi citizens. One of the suspects also provides support to terrorist elements conducting attacks against Iraqi SF. BAGHDAD – During security ops in the Sadr City area of Baghdad, May 7, SOF were providing security for Iraqi and CF who were making safety infrastructure improvements in Sadr City. During the op, criminal elements attacked SOF with a coordinated complex attack involving 2 IEDs, RPGs and small arms fire. SOF returned fire killing 2 enemy fighters on a rooftop. BAGHDAD – Iraqi SF and soldiers from 3rd BCT, 4th ID kept the pressure on rogue criminal elements in the greater Baghdad area May 7-8, engaging IED emplacers and armed individuals and discovering weapons caches. At approx. 10:40 a.m. May 7, IP from 3rd Bn, 4th Bde, 1st Iraqi NP Div, and , were attacked by criminals using RPGs and small-arms fire in Adhamiyah. An AWT was called in to assist, fired a Hellfire missile and killed 2 Special Groups criminals. At approx. 11:40 a.m., west of Baghdad, soldiers from 2nd Stryker BCT, 25th ID, discovered 3 mortar rounds, 4 grenades, a land mine and numerous blasting caps. At approx. 3 p.m. in Kadhamiyah, IA soldiers discovered a substantial weapons cache, which consisted of 53 blocks of C4, 2 107 mm rockets, an 82 mm mortar round, several rocket rails, 6 grenades and highly-detailed maps of Baghdad, and an assortment of weapons materials. At approx. 7:10 p.m. in Sadr City, soldiers from 1st Sqdrn, 2nd Stryker Cav Regt, attached to 3rd BCT, 4th ID, identified individuals firing AK-47s from a building, and a M1A2 Abrams tank fired 2 high-explosive rounds killing 2 criminals. At approx. 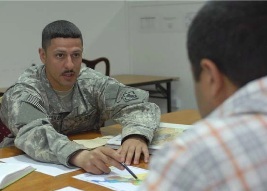 7:30 p.m., soldiers from 3rd BCT, 4th ID, were attacked by criminals using small-arms fire in Sadr City. The soldiers returned fire and killed one criminal. At approx. 10:30 p.m., an AWT fired a Hellfire missile and killed 2 criminals who were emplacing an IED in New Baghdad. At approx. 1:30 a.m., an AWT observed a group of armed individuals maneuvering towards dismounted soldiers from 4th BCT, 10th Mtn Div, in New Baghdad, fired a Hellfire missile and killed 5 criminals. The AWT fired a second Hellfire and killed 4 criminals trying to escape. At approx. 1:45 a.m., 2 criminals were spotted by an AWT emplacing an IED in Kadhamiyah. One criminal was killed when the IED detonated while being emplaced. The second criminal fled into a residential area so the AWT did not engage him. TIKRIT – After receiving small arms fire, SoI repelled an enemy attack, killing 4 insurgents and discovering a large cache in the Salah ad Din province, May 7. Several suicide vests were discovered along with 800 lbs of homemade explosives and other IED making materials. BAGHDAD – Actors from the popular Iraqi sitcom, “Mud House,” performed the first comedic play performed in Wasit Province since 2003, in al-Kut, May 4. “People and People” conveyed Iraqi life from a comedic perspective to entertain the Wasit audience and give them hope and optimism for the future. Fifteen hundred people filled the Municipality Hall in al-Kut to see the play, which was sponsored by the U.S. Dept of State in coordination with the 214th Fires Bde and the IP. Baker said ISF remained conscious of the opportunity for mishap because of the large number of people gathered. “It’s an indication of the growth of their capabilities. They are more proactive and organized. There were no incidents.” Because of the large turnout, the actors held an encore performance May 5.